Crucial Review 2019: Is Crucial a Good Hosting? Since their launch in 2003, Crucial has been providing web hosting services to individuals and businesses of all sizes in Australia. This award-winning vendor has an interesting mix of web hosting solutions supported by over 7,000 virtual servers. Crucial is a web hosting company based in Australia. Since their inception in 2003, this award-winning vendor has amassed over 7,000 virtual servers and developed a system that can handle over 8.8 terabytes of data with ease in any given day. Crucial hosts over 50,000 websites for over 6,000 English-speaking customers worldwide. All of this looks like an excellent mix of features and resources, particularly if you need an Australian-based server. However, because they only offer one shared hosting package, you really don’t have much of a choice in the type of features you’re getting if you go with Crucial. What if you don’t really need that much space and data transfer, and you can do without unlimited emails and subdomains for now? What if you only need to host a single, basic website? With this shared hosting package, you still have to pay for all the extra features and resources you’re not using, unfortunately. Also, their beginner-friendly tools are rather lacking: I’d have liked to see a good drag-and-drop website builder thrown in. 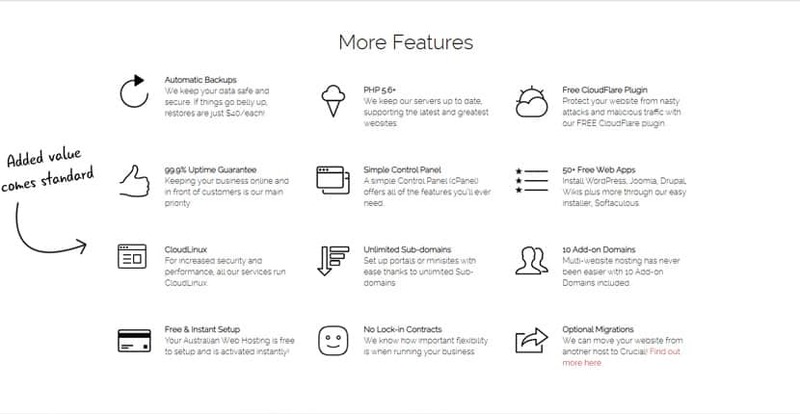 You can still get a decent website set up pretty quickly with the help of Softaculous, but note that they only include the basic version with 50+ pre-installed applications – as opposed to the 400+ typically offered with the full version. I liked that they only offer a single shared hosting package: it keeps things straightforward for the end-user. But as mentioned previously, it could also mean that you’re paying far more for stuff you don’t really need. For instance, their 50GB data storage, unlimited emails, unlimited subdomains, and ten add-on domains is far more than a beginner really requires for his or her first website. Sure, you’re getting a ton of added value as a standard, but you’re also paying far more for that added value. On top of that, while Crucial advertises a website migration service, in most cases this process will cost you a substantial sum of money. Crucial also charges extra for email migration and data restores, so while on one hand the vendor would be ideal for businesses who want convenience and reliability, their service can present extreme financial constraints to a growing business with budget limitations. That said, Crucial doesn’t tie you down with any long contracts, and they offer a 30-day money back guarantee. Crucial has an expert support team that customers can contact for help. You can contact their sales team using the phone number provided on their website or their technical support team via email and tickets. Their over-the-phone support is only available during business hours Monday to Friday, but the ticketing system is available 24/7 all year round. I generally get a response back from them within 15 minutes whenever I submit a ticket. They also have a comprehensive and well-written knowledge base. One thing to note is that Crucial’s customers have suffered a great deal ever since the vendor sold the business to a company called Digital Pacific. The new owner reduced the services available dramatically, including removing live chat functionality on the website and 24-hour email support. What’s more, network downtimes have increased significantly. While Crucial’s web hosting plans and customer support are noteworthy, their expensive price tag keeps many businesses from trying out their solutions. Unless you’re a stable business willing to pay more for reliable and secure hosting solutions, Crucial’s packages may prove to be a costly investment. Wondering how Crucial stacks up against other Web Hosting companies? Enter any other Web Hosting company and we will give you a side-by-side comparison.